Do you like to riding train instead of any other choice of transportation? Do you like exploring Indonesia the beautiful country? 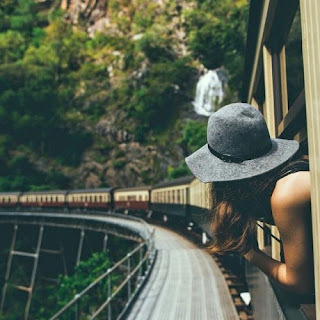 Which are the most fun destination explored by train in Indonesia? Well, this is five big cities that could be good recommendations as the primary choice of people who have been very happy to ride the train. The capital city is an attractive destination to be visited by train. The main reason of course, because the ticket pricing was cheaper than a plane. In addition, the main train stations in Jakarta is very good to visit, such as Jakarta Kota Train Station (BeOS) with classic style and Gambir Train Station with a modern touch. On arrival at Gambir Train Station, you can walk for a while to explore the National Monument (MONAS). From there, you can go back on foot to visited the National Museum, the National Gallery, and Pasar Baru. BeOS train station located at the legendary Old Town neighborhood, so when you take a step out of the train station you can exploring the history of Jakarta as much as you want! Bandung city will show more romantic and creative side than Jakarta. Bandung also still have some classic areas, such as Jalan Kebon Jati and Braga. Want to cool off in the natural hills? There are Minneapolis and St. Paul that are ready to said hello to you. If you want a relaxing place, but memorable, you could come to Alun-alun Kota Bandung as well as various theme parks there. Additionally, you can settle for a shopping tour in the city. If you bring your family while on vacation to Bandung, Trans Studio Bandung is the most appropriate places to visit. For more unique recommended place, please ride KRD to Padalarang and visit the Kota Baru Parahyangan that providing entertainment and residential superblocks complete with a sundial, science and technology center, water sports center and its 4D theater. Visiting Yogyakarta by train is fitted well to really feel the aura of this down to earth city. Every train station in Yogyakarta look so classic traditional and still filled with a touch of the past. Peoples activities became very interesting to be enjoyed. While walking around there, we will be satisfied enough with traditional culinary and shopping there. Malioboro market has a very strong local culture. For the eastern region of Java, Surabaya were the highest purposes. The city is always full of tourist when it comes to holiday. Business, culinary, education, shopping and travel history became the main travelers destination at Surabaya. According the news, PT KAI also initiate fast trains in route Jakarta - Surabaya which only takes 5 hours (usually we took a 13 hour of riding train for this route). This obviously makes more fun for a visit Surabaya with train. In City of Heroes, the most exciting things to do is the historical and culinary tours. In this city, historical sites became destinations that we must visit, especially Tugu Pahlawan. We should also devote some time to relax in the Taman Bungkul that getting popular in Southeast Asia. You should also try to further train ride to Malang city. With paying ticket price around Rp 40,000 to ride Economy or Business class train, you will arrive in Malang within 2 hours. When arrived in Malang, bakwan malang or meatball soup of Malang could be enjoyed the train station. Malang is still a favourite destination for a family holiday in East Java. Here, there is a famous tourist attraction, such as Jatim Park, Secret Zoo, Batu Night Spectacular, Pasar Parkiran and more. For you that love beach so much and love them more when it's still natural and not many people living there, you can held a retreat to the Sempu Island and camping there. Malang has rows of exotic beaches and waterfall too. Meanwhile, for those who like adrenaline boost, Malang Attraction ready to satisfy you with the paralayang.